It’s actually quite normal for a new oven to smoke a little the first few times you use it. This is due to the heat burning away the protective oil layer that was applied during the manufacturing process. It’s sometimes called a burn-in period and you may be advised to use the oven without any food in it to get rid of the residue. After a short space of time, the smell and the smoke should be eliminated. It’s very frustrating when you find that your newly cleaned oven smokes! This is caused by chemical cleaning residues being left behind and burning off as the temperature in the oven increases. The smoke is quite unhealthy and can irritate your eyes when you open the door. 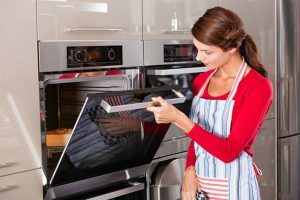 You need to make sure the cleaning solutions are thoroughly removed before you use your oven again after cleaning it. Why is my oven smoking? Too much grime and grease is the main culprit here – splattered residues on the floor and walls of the oven cook alongside the food, often causing oven smoking while baking! If you’ve grilled fatty cuts of meat or left remnants of takeaways on the oven racks particles will fall onto the oven floor and turn to ash emitting a cloud of smoke. You need to follow the manual guide instructions to prevent an accumulation of grease and food residues that result in an ashy smoke. Allow the full cycle to run to reduce the debris and get rid of any ash with a damp sponge. Remember that during this high-temperature clean food bits may ignite, but don’t attempt to put out the flames, just let the cycle finish before you open the door. There are many cleaning solutions on the market to choose from – try a toxic-free option for an environmentally healthy clean! Harsh chemicals can irritate your eyes and skin so keep the windows open and wear protective clothing. Spray the product onto the walls and floor of the oven and wait for the recommended time. Use a sponge to wipe off the residue, and rinse with clear water to get rid of all chemical deposits. Ammonia is an organic way to clean your oven – soak a rag and leave it for 30 minutes inside the oven before rinsing with clean water. If you’ve followed all the rules and still got a smoking oven you may want to consider calling in the professionals! 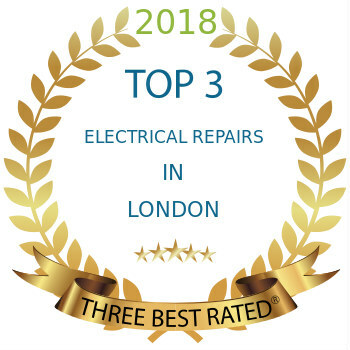 Oven repairs North London can be easily searched for online. You’ll get a company that specialises in domestic appliance fixes and provide a quality service with a quick and efficient response time. Technicians will all be fully trained, and have the skills and experience to repair a whole range of ovens. Your repair will also come with a six-month guarantee!